Landschaft Kennels German Shepherd pictures. To quote the AKC breed standard. “The first impression. Of a good German Shepherd Dog. Is that of a strong,agile, well muscled animal. Alert and full of life. We feel these pictures of German Shepherds. Fully represent that description. Click on any of the category buttons below. To view our pictures. Working line German Shepherd Dogs are a very sturdy. Outgoing breed of dog. That enjoys a variety of activities. We have pictures of Imports, Puppies, Candids and Working German Shepherds. There are pictures of working dogs. Tracking. Working line German Shepherds performing. In AKC obedience. Rally. Search and Rescue. Schutzhund. IPO. Agility, Herding. Police k9. And much more. 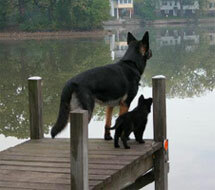 These German Shepherd pictures reflect that special bond between human and canine Companion. Whether a working dog, or a family pet. Landschaft Kennels German Shepherds. Would be happy to include your photo. In honor of these extraordinary animals. These pictures document over 25 years. Of breeding and importing excellence. It is with great pleasure. That we look back. At our involvement. With this magnificent breed. The German Shepherd Dog. We hope you enjoy our galleries.